LT5 will always remain one of GM’s most significant alphanumeric engine codes. When it turned up in 1990 the high-revving DOHC architecture was a bombshell dropped on the American performance landscape. Famously designed by Lotus Engineering, built by Mercury Marine, and introduced in the C4 ZR1, the aluminum-block V8 was unlike anything that had ever gone into the Corvette before, and one has recently shown up for sale on Facebook Marketplace. This is the OG LT5. 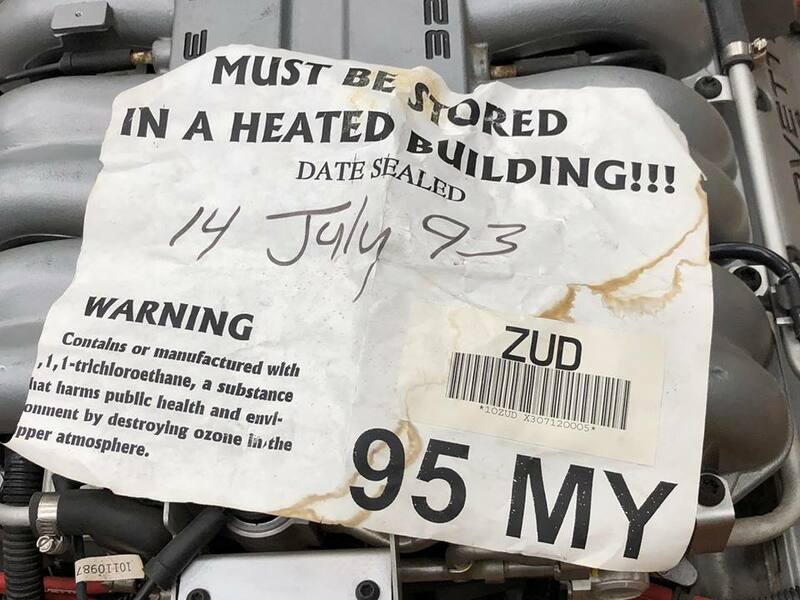 According to the packing slip, the unit in question was sealed on July 14, 1993, and was allocated for ’95 model year cars. That means it has the Lotus-penned design modifications to the cylinder heads and valves, updated cam timing, along with beefier four-bolt main caps, which helped bump output from 375 to 405 horsepower. This LT5 crate engine is totally brand new and in its original shipping crate having never even been cranked, and includes all the factory accessories like the power steering pump, air conditioning compressor, alternator, wiring harness, bell housing, and engine mounts. A very rare piece indeed. The history on this LT5 crate engine program is murky but it all seems to stem from the contract GM had with MerCruiser to build the engines. According to old stories, Chevy was locked in to buy a certain number of engines regardless of how many actual cars were made. The last of the engines supplied from Mercury’s facility in Oklahoma were actually built in ’93 and sat banked in Bowling Green for two years as production of the C4 ZR1 slowed in the latter stages. Rumor has it a stash of unused crate engines were found many years ago and allegedly released into the wild. It may not be the most powerful engine in GM history, but it certainly set processes in motion and helped the corporation learn lessons that would help turn future engines into formidable monsters. For $19,500 its performance to value proposition is pretty poor when you consider you can get a version of the 2019 Corvette ZR1 supercharged LT5 crate engine for less money, but whatever. I have one of these LT5s and I will sell it wrapped in a 1990 Corvette with only 39000 miles for the same asking price.